Well, summer is here and I finally have my first glut of tomatoes. 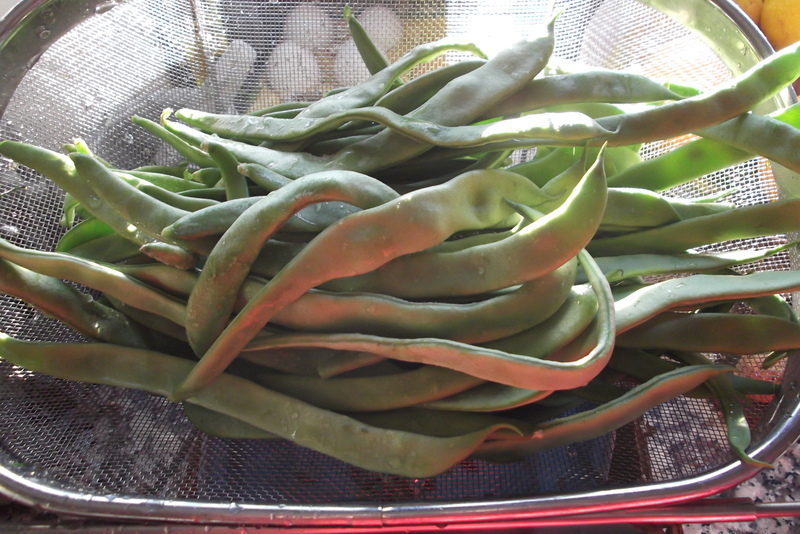 We also picked runner beans last night, although they are coming to an end now. 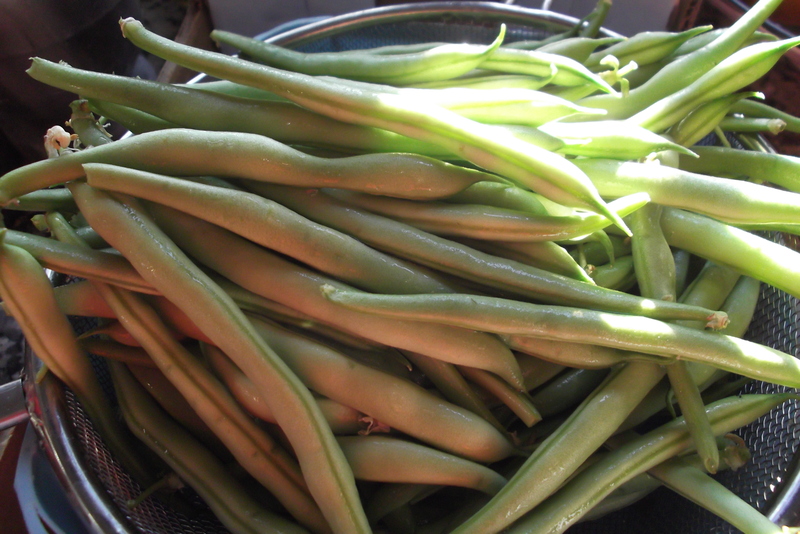 And the first of our bobby or French beans. I planted two varieties, one green and one yellow, but so far I´m only seeing green ones! Time to start laying some by in jars for the winter months. Last year I made what seemed like enough for the whole village, but by the end of April we ran out. I am on a mission this year to make enough to last us until next summer. It is a little bit of effort, but we have so many tomato plants and have also just done a second planting, that it makes sense to do it and enjoy all our hard work in the colder months. For a great idea on how to use your tomato sauce, and also the way I make mine, head over to Tales of Ambrosia for a delicious aubergine and tomato sauce dish. I started by cutting small crosses in my washed tomatoes. Then I blanched them for a minute or two in boiling water. After peeling and coring them I put them into my food mouli (although sometimes when I´m pressed for time I just blitz them with the hand blender). 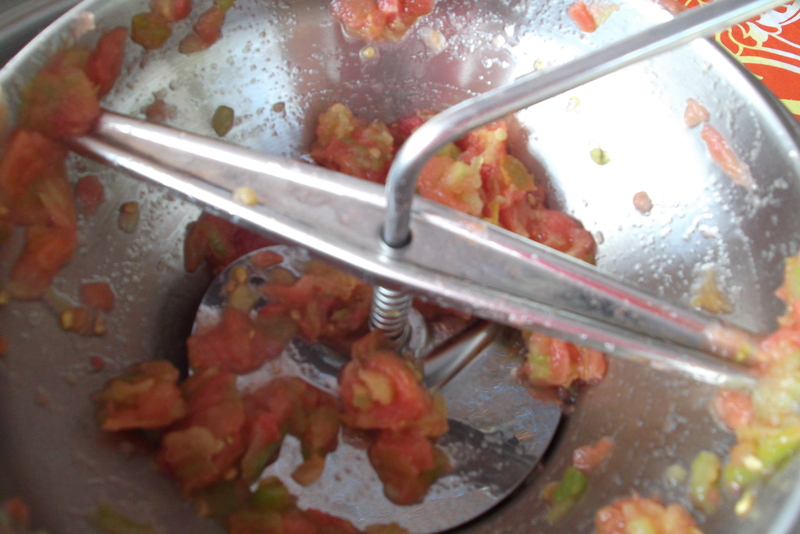 The mouli, if that´s the correct word in English, is a hand held vegetable mill and gets rid of any tough bits and seeds. Every so often you´ll need to empty out the bits you´re left with. You can either use these in soups or sauces or if you have chickens, like us, they love them as a special treat. Your chickies will thank you! 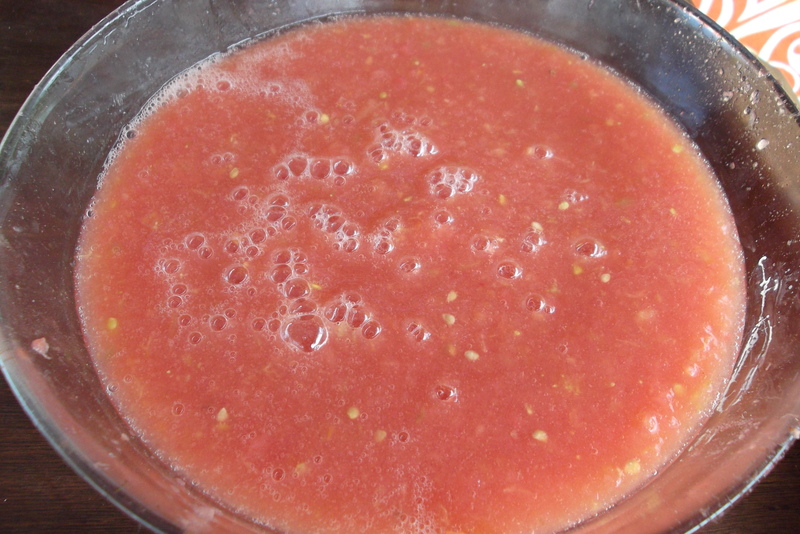 You´ll be left with a purée of tomatoes which you can now freeze, use or bottle (can). 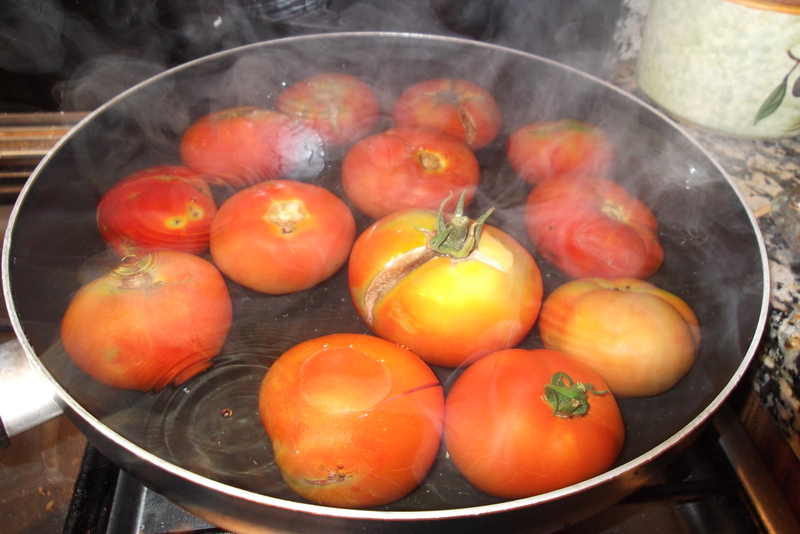 When I am going to bottle or can them, I add half a teaspoon of salt per litre of tomato and heat gently until just bubbling. This then goes into sterilized jars which are tightly sealed then left to simmer in a bain marie for about 10 minutes and then left to cool down. Today, as I had been cutting back my basil which is getting a bit overgrown, I added a spring of basil into each jar too. Now put the jars away in a cool dark place and on a dull grey day, a few months ahead, you´ll be so glad you invested a little time on a hot summer´s day doing this! This is what I’ll be doing today as our Roma tomatoes are just beginning to turn red in huge quantities! We’ve already bottled some of the other varieties. I use several different methods and can never decide which is best but all involve a mouli legumes. Sometimes I roast them in the oven first which makes them more of a puree than a sauce. Whichever method, it’s a great way of preserving summer to brighten up the winter! I do them a few different ways too – in fact am planning another batcvh tomorrow which I may roast (if I can face the heat of the oven!). Also make puree – not much as it takes all day to make one jar though! As you say, it all tastes great though on a dull winter´s day. Wow!!! First of all many, many and many thanks for mentioning my blog on you wonderful blog which I always enjoy reading so much!!! 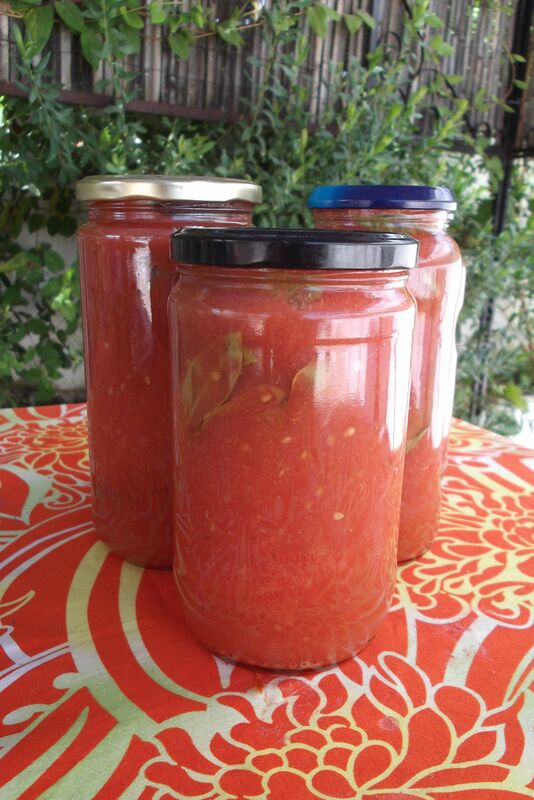 You are so lucky you can make tomato sauce out of your own grown tomatoes!! 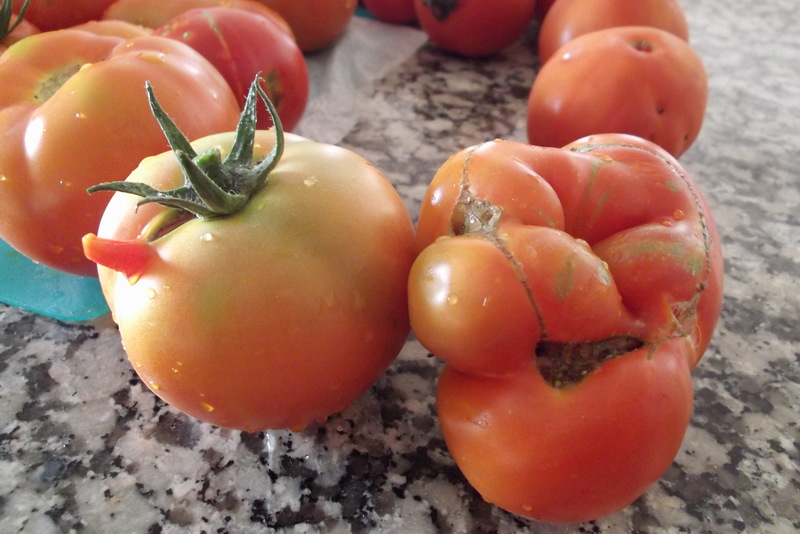 When you do not use pesticides, it is so true that tomatoes are funny looking. The same happens to my mother in law when growing vegetables in her countryside but those are the most delicious tomatoes I have ever tasted! 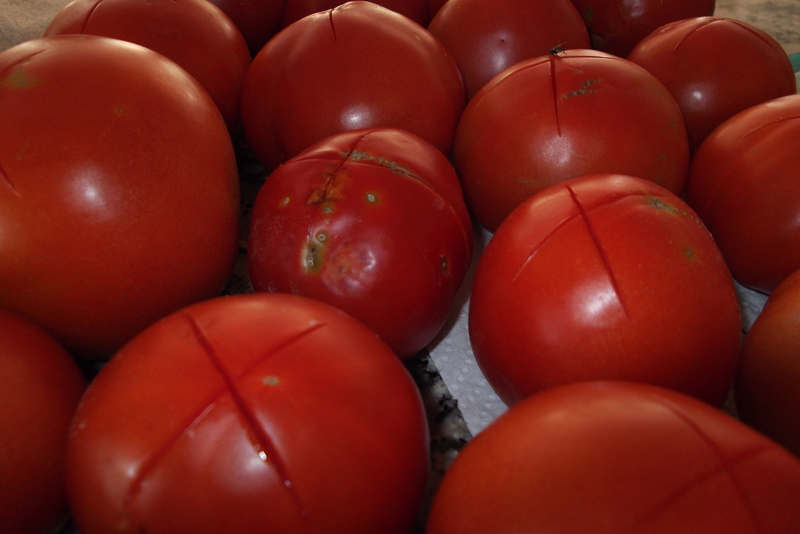 I can imagine that your tomatoes have a great taste, specially if grown under the Andalusian sun!!! Thanks again!!!! You´re so welcome – I love your posts and recipes. Hope you get to eat some of your mother in law´s funny tomatoes, the ugly ones seem to taste the best! Superb! I think this is a brilliant idea – my Dad and Pete would love to have bottles of homegrown preserved tomatoes on the shelf. Oh, I want my tomatoes to start ripening. You have a lovely harvest going on. 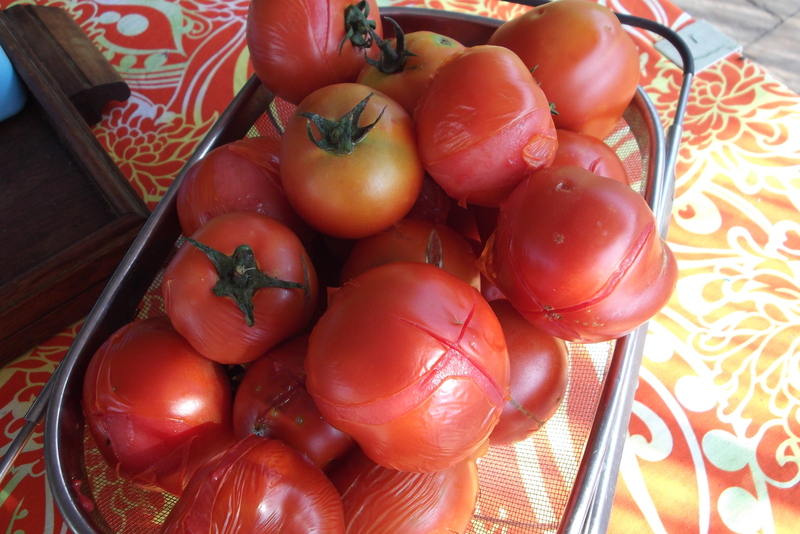 Your home grown tomatoes are the most beautiful tomates! It brought back so many memories of the tomatoes my father brought to my mother from his garden. And, she did that same process to jar up all those garden fresh beauties! I’ll be envious of you come those grey days of winter! I do feel glad of all the hard work during these hot summer days when we eat them in the winter. 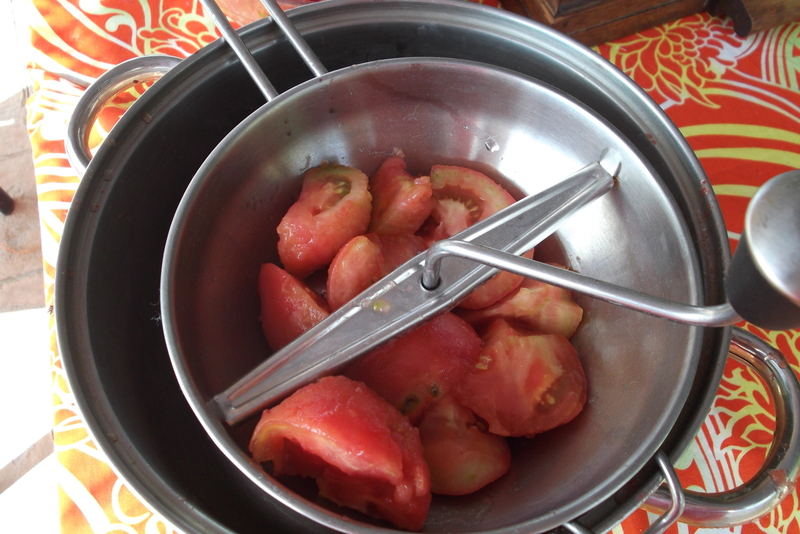 My aunties in iIaly seemed to spend all of our summer holidays either drying or preserving tomatoes, now I know why! Looks good! All of my tomatoes are still green and as they were a present from a friend, I’m not sure what varieties they are. They are all different though, which should make for an interesting harvest! To be honest, we got all our plants mixed up so where a bit unsure fo what was where, plus we had a few rogue seeds that plants sprang up from and they seem to be doing really well. It´s like waiting for Christmas! Hi Tanya! Back from our travels now. Your toms look great. Love the shapes. Got back to a jungle but the runners are going great guns. Hot as hell here so can only imagine what it is like with you! I can well imagine how you must feel when you open up a jar of preserved toms on a winters day and think back to summer…..shame we can’t bottle up this sunshine! Good to have you back! Am heading over to your blog in a moment to read your post. We are still harvesting runner beans and the plants seem to have put out a whole new set of flowers…where am I going to put them all! Hope you get to enjoy your last summer in your garden in France. Even if you just make a jar or two – you´ll be so glad you did in the depths of winter! Am going to do some roasted then preserved ones today – we´ll see how they turn out! Looks wonderful! I hope you meet your canning goal! They actually taste of tomato and not just water! Oh that looks so good I could drink it as such! I couldn’t have come across this post at a better time! Now that there are tomatoes in abundance (and deliciously ripe! 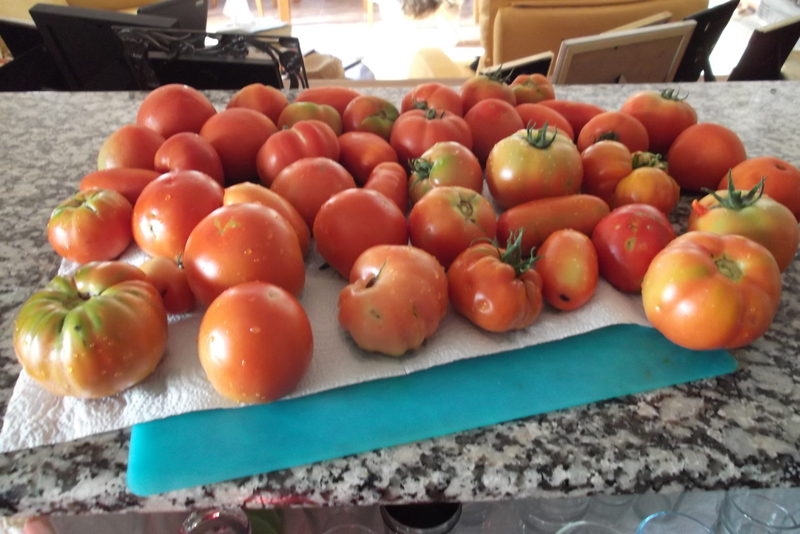 ), I’ve been trying to figure out a way to preserve them and make enough tomato sauce for the winter months. Thanks for the recipe and advice, I’m going to give this a try! Thanks for your visit and all your kind words – do give this a go, it´s so worth doing if you have the time! I can almost smell that sauce, basil and all… mmm! Love your tomatoes and honestly, you crack me up! Thanks and yum!! This entry is a reminder for me of what work lies ahead. I do not can — I’m far too nervous about botulism. I do, however, have a spare freezer in the cellar that I fill with tomatoes every year. And you’re so right. In the Winter months ahead, I’ll be thankful for the time I’ve spent now preserving these red beauties. If you have the freezer space, then so much the better! We have two freezers can you believe it, but as we live so far from big shops, they´re usually packed with cuts of meat and veg that I freeze over the summer, so canning the tomatoes is the best option for me. I can understand your caution though! Busy in a good way, summer is a time for getting things put away for winter!